SAN DIEGO -- A woman who went to see the San Diego Padres left as a brand new madre. 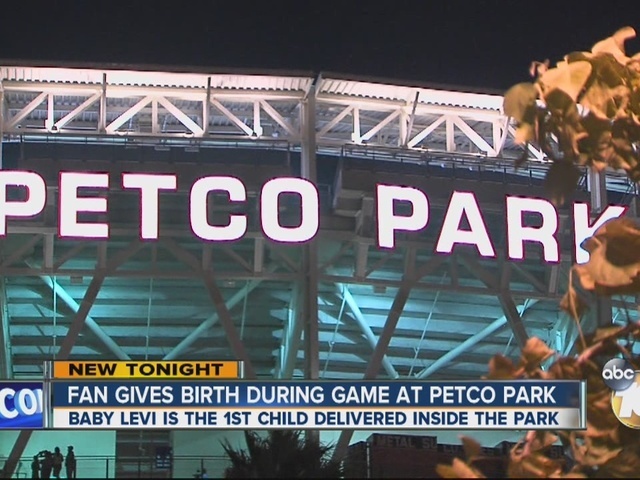 Petco Park announced that a baby boy was born in the third inning of Thursday night's game against the San Francisco Giants, the first in the ballpark's 11-season history. We welcomed a baby boy to the world in Palm Court Plaza earlier this evening. First baby to be born at Petco Park! ? Donna Borowy, an on-staff nurse with Petco who is also a midwife, was called in to deliver the baby near the elevators in front of the Padres store. The nurse told 10News the mother began having contractions at 4:30 p.m., but still made it to the game for its 6:10 p.m. start time. Borowy said the mother was cool and calm during the whole ordeal. Capt. Joe Amador of the city's Fire-Rescue Department tells the San Diego Union-Tribune that the baby and mother were taken by ambulance from the park to Kaiser Permanente San Diego Medical Center. The Padres later tweeted that a great crowd of 31,137 enjoyed the game -- not including the baby boy born around the third inning.